I knew I could walk 15 miles in a day; but could any of us walk 15 miles the next day … and the next? We would soon find out. I joined 31 other pilgrims on the Camino de Santiago. This is Galician for the Way of Saint James. The Camino is a network of paths to the shrine of the Apostle James (brother of John, son of Zebedee and the first of the Twelve to be martyred). The shrine is in the Cathedral of Santiago de Compostela in Galicia in north-west Spain. You can start the Camino nearly anywhere in Europe, but to ‘qualify’ you must walk at least the final 117 km (73 miles). We walked for five days, but the luxury way: our luggage was taken by van from one hotel to the next; many pilgrims carry all they need on their backs and stay in simple hostels. Most of us carried a scallop shell, long the traditional symbol of pilgrimage. And we carried a document called the credencial, which cost us all of 2 euros; also known as the ‘pilgrim’s passport’, the credencial had to be stamped at least twice daily (some days we got a dozen stamps) at churches, cafés, tourist offices and other places en route. This qualified us to receive a Compostela (certificate of completion of the pilgrimage) when we reached Santiago. There the Pilgrim Office gives more than 100,000 compostelas each year to pilgrims from more than 100 different countries. So what was it like? Certainly an experience, with highs and lows, just like the Camino itself. Most of the countryside was beautiful, the guide was an inspiration, and walking with a group of Christians (of all flavours) was wonderful – a true pilgrimage. But there were painful knees and feet, fortunately not for me. It was almost an anti-climax at end the journey on reaching Santiago, but there was a great sense of personal and group achievement and an amazing service in the Cathedral, where we saw the Botafumeiro, the largest thurible in the world, swinging until it almost touched the ceiling. Even more impressive than this enormous incense burner was the fact that there were thousands of other Christians of many denominations receiving Communion with us, and most of them were in their teens or twenties. 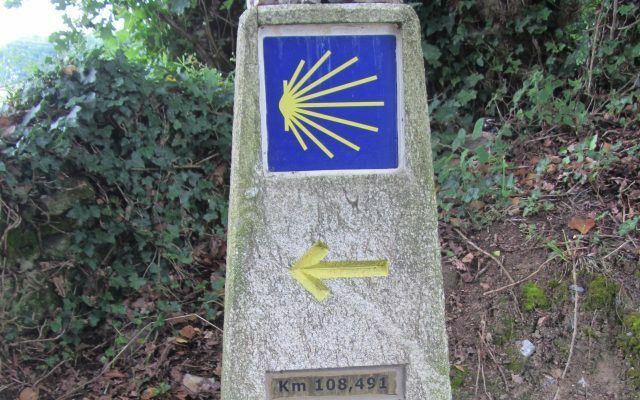 Are you planning to walk (or cycle or even ride) some of the Camino next year? Why not get friends to sponsor your every kilometre for the MET?